Amobi Okoye is officially the youngest player to be drafted in NFL history at 19. 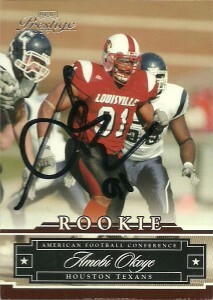 Selected in the first round (10th pick) by the Houston Texans in 2007, at 6’2″, 315, (4.85 40,) Okoye is also the highest Louisville player drafted in the first round. As he is so young, Okoye is still expected to grow into his frame and has tremendous upside potential. He would earn NFL defensive rookie player of the month honors in 2007- the youngest player to do so. While Okoye made a splash in the NFL his first month, the rest of his transition has been rough and inconsistent. Many critics point to the fact that Okoye, (who will be entering his 4th season in the NFL) hasn’t been the run stopping force that the Texans had hoped he’d be, but Okoye has manned up, taking the blame by stating that he was overwhelmed by the riches the league afforded him and absorbed in starting a charity in his native homeland of Nigeria. Over 2010, Okoye made major strides however, refocusing and setting career highs in tackles and recording his most sacks since his rookie season. On 10/17/10, Amobi made 6 tackles and a sack (on the final play of the game) to preserve the victory over the visiting Kansas City Chiefs, 35-31. After the conclusion to the 2010 season, questions remain as to Okoye’s future with the Texans as with a conversion to the 3-4, it is unknown how he figures into new defensive coordinator Wade Phillip’s plans as an undersized gap shooting NT or a defensive end. In the meantime Okoye remains active in his native country of Nigeria and recently helped found an American Football program with other members of the NFL there.